Union Assurance PLC launched its latest medical insurance scheme, the 'Union Family Health Net' on Tuesday. The new scheme will help overcome the burden of health expenses, Senior Manager, Health Insurance, Deshapriya de Silva said. The necessity for such an scheme was felt as the medical expenses are increasing day by day, and with an increase in non-communicable diseases, and increase of life expectancy, Deshapriya said. 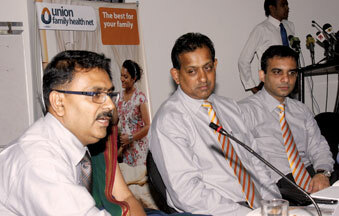 Deshapriya said that 246 million diabetic patients were detected in 2007, throughout the world. One out of six suffer from stroke in their life time. Addressing the media at Union Assurance headquarters after launching the 'Union Family Health Net' Deshapriya said that there will be more cases of hospitalisation and a huge amount of money will be required. The Union Family Net will help overcome this problem. The introduction of high-tech treatment has made medical bills go up. The number of road accidents has also seen an increase. The Government is contributing 47.5 percent on health while 52.5 percent is paid by private sector. Private Health Banks are contributing only 4.73 percent. 45 percent is out of pocket expenses. This is the segment we are targeting, he said. All citizens between 1 and 65 years are eligible for protection with the option of individual or family package. Due to its unique top-up features, an individual who is covered by their employer can extend the same to a family package by simply paying the difference. The maximum age entry is 55 years. Applicants below 45 years are required to undergo a medical examination to qualify. The unique features of 'Family Health Net' are stand-alone policy (you need not have any other policies at Union Assurance), free critical illness extension up to a maximum of 150 percent of the annual limit, critical illness cover for 30 major conditions and free accident death cover for 200 percent of the annual limit, Deshapriya added.